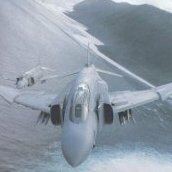 Here is an F-4S Phantom II with only 2 skins. I have in my personal stash version more skins, but I need to finish tweaking. The completed version will have more skins and I'll include weps and sound files, pilots etc. If no pilot shows up when u try this one you'll have to edit the 'data' file and change the pilot with one you have. I just realized I neglected to change the sound settings in the data file...so i enclosed my j79.wav files. Be careful not to overwrite what you don't want to loose, so I'd unzip it to somwplace like C:\Temp...the copying to the right folders.